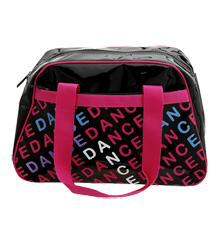 Bowling style dance bag with "Dance" letter print and contrast webbing trim. Black PVC with Poly bright pink lining. This bag has 2 shoulder straps and a front external zip pocket in addition to the main zip-top opening compartment.